In order to be shipped to the stores of XinXii’s international distribution partners, e-books need to be shaped in a specific file type called EPUB. Because EPUB format, like most web content, is coded in HTML it enables readers to modify the layout of the content according to their individual preferences (in respect of font styles and sizes, e.g.) which is why it can be described as a “dynamic” format. This means that, in EPUB, there is no longer a fixed page design like in PDF or in printed books because the way the content is displayed—on the screen of an e-book reader, for instance—always depends on the preferences the user has set. Amazon is using a proprietary in-house e-book type called MOBI but this is quite as dynamic as EPUB so that the content behaves just the same way. We appreciate valid EPUB originals as source files for distribution of course, but since probably not every self-published author will be familiar with this specific file type, e-book conversion of several source file types into EPUB/MOBI is included in our distribution service (and even free of charge for all fiction content). And to ensure a solid conversion result, we need you to contribute by formatting your source files properly in your text edit software right from the start. There are a few things that should be kept in mind regarding the page design of your Word or OpenOffice projects. For extensive information about how to layout your ebook conversion source files, please have a look in the XinXii Style Guide which can be downloaded from our website for free. But there is one particular slip which seems to be pretty common among self-publishers so that we want to put it out here to let everybody know what should be avoided. We’re talking about how to create paragraphs correctly. This is most certainly not the kind of layout readers (esp. 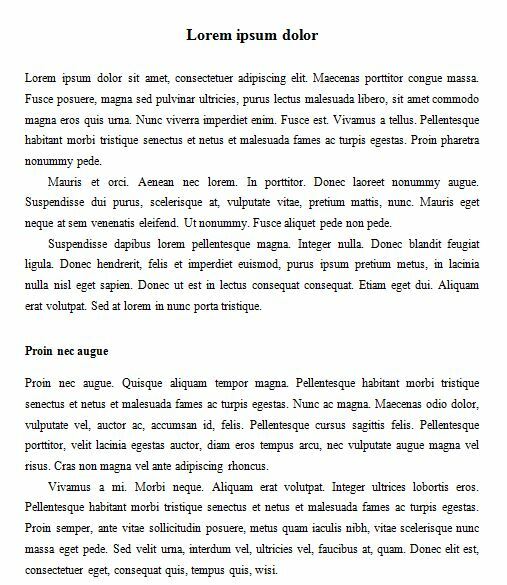 of fiction) are used to, for in neatly designed books, paragraphs will usually come without margins but with so-called “first-line indent” style (i.e. some blank space at the beginning of the paragraph). Only first paragraphs after scene breaks will have a (single, or maybe double) blank line as spacing before and will not feature indent (same with opening paragraphs after headings). Thus, it’s obvious that authors are looking for opportunities to avoid the default bottom margin set by Word, in order to make their page setup look more professional. And that’s just where some of them seem to get trapped by a quick and dirty solution (which is at least pretty frequent among German Word users): For if you happen to press SHIFT+ENTER at the same time, you’ll end up with a line break that might be mistaken for a paragraph break without margin, at least at a quick glance. Well, this might look like the solution wanted, but trust me, it is just not. And what is more, that procedure will necessarily fit your document with a layout which is absolutely unfit actually when it comes to e-book conversion. Not only will it produce fake paragraphs instead of properly formatted real paragraphs which are meant to lead the flow of reading with their indent but it will also result in creating a corrupt HTML EPUB. Fake paragraphs in e-books cannot be fixed without loss of other style information (such as italic or bold formats, e.g.) and might even cause retailers not to accept e-books in their stores because of substandard layout. So, you really should not lapse into creating “soft breaks” instead of proper paragraphs. 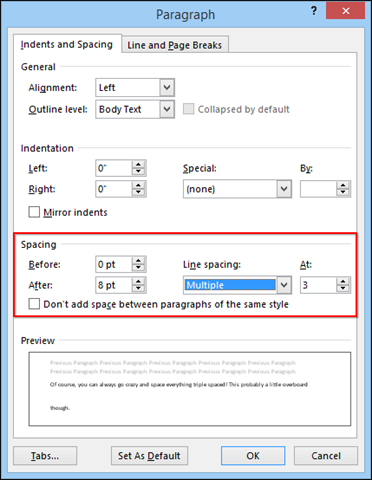 It’s not rocket science to set up a neat paragraph design without spacing in the respective menu which is just a right click away, and once you did so, you will also spare the clumsiness of always pressing SHIFT simultaneously with ENTER. And if you also add first-line indentation to the paragraph layout—and drop it after headings and scene breaks which, again, would take nothing but a right click—you will both give your layout a professional look and ensure a high quality e-book conversion. 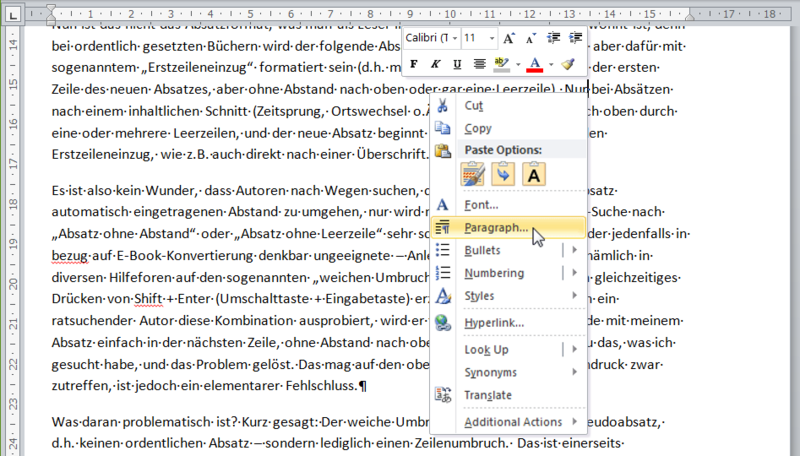 This text is a translation of my German article referring to some default settings of MS Word that might be different in the English or any other international edition of the software. I apologize for any inaccuracy possibly due to that. Matthias is a member of the XinXii Distribution Staff. He holds a Master's Degree in German Language and Literature from the University of Bochum and is specialising in the production of e-books since 2009. His hobby horse are Fine Arts, especially theatre, literature, and photography.